When Glenn Sullivan signed with the Cubs in 1987, it came with an extra agreement. The extra agreement was, that fall, he could return to college and play ball there - football. And Sullivan eventually took advantage of that agreement, playing backup quarterback for the No. 1-ranked Oklahoma Sooners. "I was a little rusty when I first went out there," Sullivan told The Associated Press that December, "but it started coming back to me." Sullivan soon, however, left football behind for good for a career in baseball. That baseball career lasted six seasons, with Sullivan getting as high as AAA, but no further. He never made the majors. 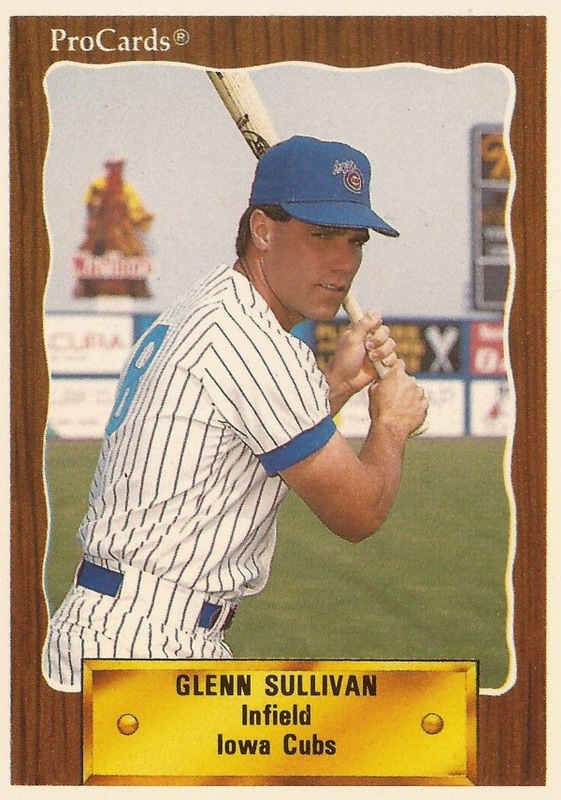 The Cubs selected Sullivan in the 29th round of the 1987 draft out of Oklahoma. The backup Sooner quarterback scored two touchdowns late in an October 1986 game. But baseball was the game Sullivan eventually settled on. Sullivan spent his first professional baseball season with short-season Geneva, hitting .301 with five home runs. After his stint back with the Sooners, Sullivan returned to play at single-A Winston-Salem in 1988. His average dropped to .249, and he hit seven home runs. For 1989, Sullivan moved up to AA Charlotte. He hit eight home runs that year, with an average of .254. He hit one of his home runs in an early August game, against Huntsville. It was in 1990 that Sullivan hit AAA for the first time, with 28 games at Iowa. He hit just .103 and spent the remainder of the year back at Charlotte. The next year was Sullivan's last with the Cubs. He spent it at Iowa, getting into 99 games and hitting .247. He also hit four home runs, one in a May game against Toledo. He also got three doubles in an August game. Sullivan isn't recorded as playing again until 1995. In the meantime, he worked with his father's film production company, according to The AP. Sullivan signed on that year with the independent Lubbock Crickets of the Texas-Louisiana League. He played in 1995 and 1996. In 1998, Sullivan was the Crickets manager. As Crickets manager that year, Sullivan watched two of his best hitters get signed elsewhere, one by the Cardinals, according to The Lubbock Avalanche-Journal. "We're going to have to go with speed," Sullivan told The Avalanche-Journal that May. "We're not going to hit the three-run homer with the guys I have."